High-quality porcelain brush with a multifunctional handle. The benefits, function and design set new standards. The natural hair consists of 1A Kolinsky quality, which means an ideal combination of stability and elasticity for porcelain processing. A fine brush tip is formed due to thick hair. 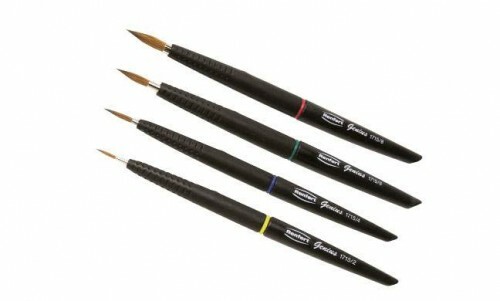 The multifunction handle protects the brush tip. hood for the brush tip during work breaks. Protective sleeve in the handle is slipped easily over the tip. ideal storage position – standing on its tip. This prevents porcelain deposits and splaying of tip bristles.